for four courtesy of Carter Plantation. in Denham Springs’ Antique District. – Family four-pack of tickets to the Livingston Parish Fair, including four tickets to the rodeo. – 1 -1/2 hour couples massage courtesy of The Natural Touch Therapeutic Massage. Geaux vote here! We can’t wait to see the February 2013 issue of Country Roads Magazine to see who all wins. Hint: At the end of the survey they let you put in your favorites if you didn’t see them during the survey… Who’s your favorite restaurant! 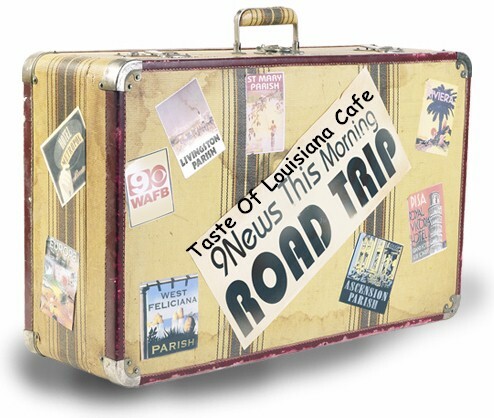 This Friday, May 7th we’ll be cooking Seafood Stuffed Potato on the Channel 9, WAFB TV news as part of a live broadcast from the Antiques Village here in Denham Springs. This live, two hour news show will be from 5AM to 7AM in front of the Denham Springs’ Old City Hall on Mattie Street , right off of Range Avenue. Come join the fun and be on live tv! We’ll see you there! To view our menu click here, and to see pictures click here. PS: Here is the recipe for our Seafood Stuffed Potato we made on live tv today. Thanks WAFB TV for coming out to Denham!